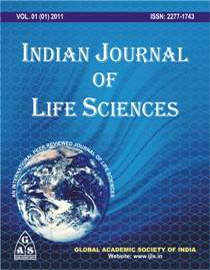 Indian Journal of Life Sciences(IJLS) is the the official publication of Global Academic Society. IJLS is multidisciplinary and peer reviewed journal of science and technology which is published in the month of August and January. This Journal aims to promote all areas of pure and applied sciences and also cover recent discoveries in the structural and functional principles of scientific research. It has wide range of circulation and visibility in India and other countries. It is easy and effective medium for advertisement in different areas. Thus, it offer excellent media for promotion of your institution, organistion, banking seminars symposia, conferences, medicals and other product services.